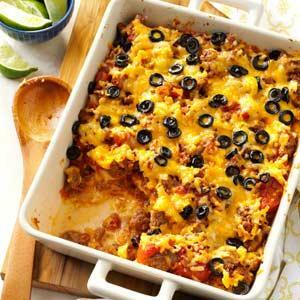 Tamale Pie is one of those restaurant recipes I "go to" when I am pressed for time. It is delicious but it is very quick to put together and bake. With a little salad to accompany this casserole, everyone is very happy. Some of the restaurant guests order it with a glass of beer and their favorite hot sauce, or when they are feeling a bit adventurous, they try a "new" hot sauce, one they haven't had before. It's great fun! This recipe is unique for me (this website) because it calls for ("allows") the use of pre-made products, but keep in mind ...some of the ingredients are brand specific. It is a quick, easy meal to prepare. It is delicious as well. Preparation time: 15 minutes. Serves 8. That's it! You're ready for dinner! Serve this favorite restaurant casserole recipe with shredded iceberg lettuce garnished with tomato, avocado and Thousand Island Dressing or Bleu Cheese Dressing. 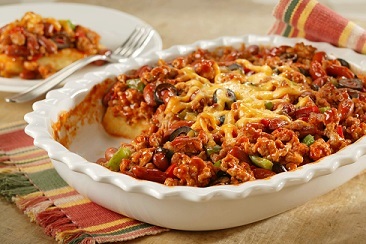 Enjoy the restaurant casserole recipe and the company you share it with! "I date you on Cinco de Mayo if you'll promise to quit calling me a 'hot tamale.'"